When cleaning intricate wheel patterns or motorcycle components, most people resort to wrapping two or three fingers in a towel to reach into narrow spaces. Towels really aren’t thick enough to offer your fingers any protection and they can slip off your hand. Flex Foam Finger Pockets are soft, dense foam pockets that fit over your fingers for easy and efficient cleaning. One pocket fits snugly over three or four fingers, depending on how large your hand is. You get the maneuverability of using your own hand as a cleaning tool along with the polishing capability of quality foam. Plus, your fingers are cushioned against potentially sharp edges while you work. Black Fine Flex Foam Finger Pockets are paint safe and perfect for applying waxes, sealants, and trim and tire dressings. Flex Foam Finger Pockets are each double-sided so you can turn it over when it becomes soiled. You get 360° of foam for cleaning! The high-density foam will absorb cleaning agents and polishes to prevent dripping onto unintended areas. 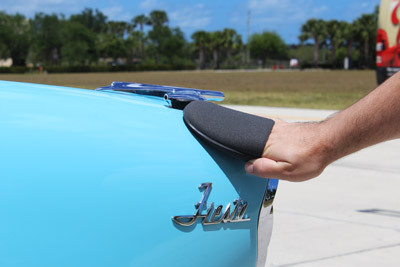 Finger Pockets are invaluable when cleaning, polishing, and protecting your vehicle’s grill, wheels, exhaust, door handles, and other hard to reach areas. I have used this twice for Opti-Seal. I can coat my mustang in about 10 minutes being careful to get all areas. The foam pocket fits on a hand perfectly and doesn't come off like the yellow foam applicator from Optimim does. The only downside is that this foam is a bit more coarse than the Optimum foam. That said no scratches or swirls instilled by this foam and it stores easy by slipping over the Opti-Seal bottle. These work great applying polish to railings and cleats, however not sure how long they'll last they seem kinda flimsy. Maybe its just me but time will tell. You need those for a fast and easy application. Consone never has enough finger pads! These are fantastic applicators. I skipped over purchasing these for a very long time because I thought it would be similar to the Dodo Juice finger applicators. I'm happy to say that I was VERY wrong. These are much denser and quite a bit larger. The foam does not soak through as quickly. It holds the product on the face of the pad much better, so that you can actually use liquid products with it. This foam is very similar if not the same material as the yellow round applicators (which are a favorite). These excel for products that are very sticky upon application and spreading. They help you get a good grip on the applicator without wearing out your thumb and index finger. I have since used them with pinnacle paint sealant and surface coating. For spray on products like the coating they also work very well. Its easy to tell when more product is needed and when the surface gets grippy. Now, like any other product you really need to use common sense. If you have very large hands and your four fingers dont easily fit inside the applicator dont force them. use 3 fingers instead. If you insist on jamming too much into them you could probably expect the edge to rip. and once that happens the applicator is likely going to come apart. As long as you understand that, you should have no issues. If the applicators were rip proof they probably wouldn't be paint safe on the sides (because of a glued or stitched edge).